Professional golfers and celebrities team up for the Alfred Dunhill Links Championship played at St Andrews, Carnoustie and Kingsbarns this week. Tyrrell Hatton is defending champion and Rory McIlroy starts. Rory McIlroy will play his last event of the season at this week’s Alfred Dunhill Links Championship and it will be his last chance to claim a victory in 2017. The Northern Irishman is taking a break after this event to fully recover from injury and to recharge his batteries for 2018. McIlroy has three-times been a runner-up in the event and he finished third way back in 2007, earning his European Tour card as a result. McIlroy heads into the tournament on the back of a runner’s-up finish to Paul Dunne in the British Masters at Close House. Tyrell Hatton is defending champion at the Dunhill Links and he is just one of a number of star players set to compete over the links of Fife and Angus. Race to Dubai leader Tommy Fleetwood will play, he’s finished in the top-five three times in this event. Former winner Branden Grace tees it up as do Martin Kaymer, Padraig Harrington, Ernie Els, Graeme McDowell, Lee Westwood and Paul Lawrie. The first three rounds are played over St Andrews Old Course, Kingsbarns and Carnoustie and those who make the cut play a final round over the Old Course. The split of venues provides spectators with a unique opportunity to get close to the professionals and to their famous partners. Over the first three days, admission is free with a ticket price of just £20 (£15 for concessions and free for under 16s and students) on the final day at St Andrews. Among the celebrity amateurs playing are: actor Jamie Dornan, sports stars Kevin Pietersen, Wladimir Klitschko, Brian O’Driscoll and Luis Figo. The Dunhill Links Championship was first contested in 2001 when Paul Lawrie was the champion. He holed a putt from the Valley of Sin to take the title by a single stroke. In the following years this event has been won by some of the European Tour’s biggest stars. Padraig Harrington has twice been victorious and Lee Westwood, Colin Montgomerie, Robert Karlsson and Martin Kaymer have all been champions. The weather looks changeable with some windy conditions likely. That should suit those able to flight their golf ball lower. Look out for the British and Irish players who have grown up playing seaside golf. Rory McIlroy – The Northern Irishman has been runner-up three times and will be eager to end his season with a win. He was second last week at Close House. Tyrrell Hatton – The defending champion is a fine links golf player. He’s been second and fourth in the Scottish Open in the past. He was tied 8th last week in the British Masters. 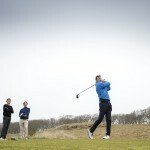 Richie Ramsay – Another excellent links golfer, Ramsay showed good form last week. He was runner-up in this event in 2014. Key hole: 17th Old Course St Andrews. The most famous hole in world golf, if the competition is tight as the leaders reach the Road Hole for the final time, this is where it’ll be won and lost. Skills required: Adaptability – Three courses mean the players will have to answer the different questions posed by each. Plus, they’ll have to deal with partnering an amateur golfer.